Jumping on a trampoline is an activity that brings people joy. There is simply no way to not be happy when you’re jumping on an inground trampoline! We’re not sure if that’s a proven fact, but we believe it is! Trampoline jumping is so popular it’s now a sport at the Olympics. If you have an inground trampoline that you have been enjoying we want to give you some information to check the inground trampoline springs. No matter what type of exercise equipment you use and enjoy, there comes a time when you simply need to do a bit of recon and give it a good once over and inspection to assure that everyone who uses it will continue to be safe. 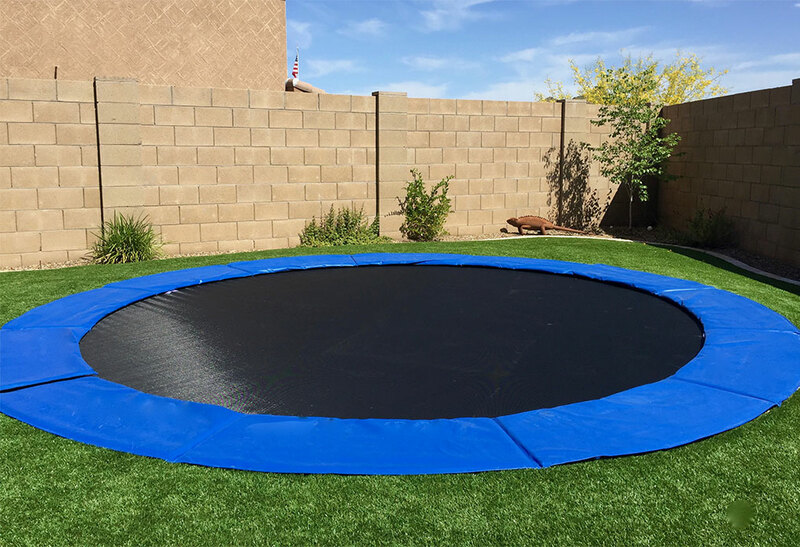 Bottom line: An inground trampoline sits in an excavated area in your yard, it has special fabric in the center that is connected with special trampoline springs. You need to check the fabric as well as the springs at least annually. Because an inground trampoline doesn’t have too many moving parts, the springs and the fabric are the heart and soul of the equipment. A spring based trampoline is more durable than those made of elastic bands, but both styles need annual inspections. Your inground trampoline’s springs will be of galvanized metal to prevent rusting because the trampoline is exposed to the elements year round. The springs may also be made of steel or zinc as these metals are also virtually rust proof. Why do you need to inspect the springs? The springs are what give you bounce and what hold the fabric taut for jumping. The more often you use the tampoline, the more stress is placed on the springs and fabric and this can cause them to wear out. They can stretch and become weak and will need to be replaced. To protect the inground trampoline, you will want to cover it when it’s not being used. This will keep dirt and debris and rain and other elements from destroying the integrity of the fabric and the springs. When you need to replace the springs, reach out to us and we can assure you get the correct kind for your inground trampoline. They are easy to replace and you will be back to jumping in no time!